In deze mail staat een link waarop het dertigste DKARS-Magazine is te downloaden. This mail contains a link which the 30th- DKARS-Magazine is available for download. The Wirechief just got an email from someone asking about what they think is their grandfathers code practice machine. Although I have seen many different code practice machines, this one is new to me. I'm attaching a photo that she provided. Can anyone expand on any information on it? That almost looks like the inside mechanism of a wind-up (non-electric) Instructograph was mounted on a board with a key and sounder. Well it is certainly a wind-up mechanism but the rest of it doesn't match the Instructograph. The photo shows what appears to be a square pin sticking up just about where the end of the tape is in the photo and as it appears that the spring is underneath this, it would appear that this is where a crank or key would be put on the pin to wind up the spring. The crank for the Instructograph was threaded and went into the side of the unit. The tape shown only has one strip of code on it instead of two "sides" like the Instructograph tapes. As I told the women asking the question, there were many such code practice machines made back in the "daze". I think I know what that machine is, but before I say anything more, does anyone know if the tape is the same width as Instructograph (which was the same width as standard teletype tape). 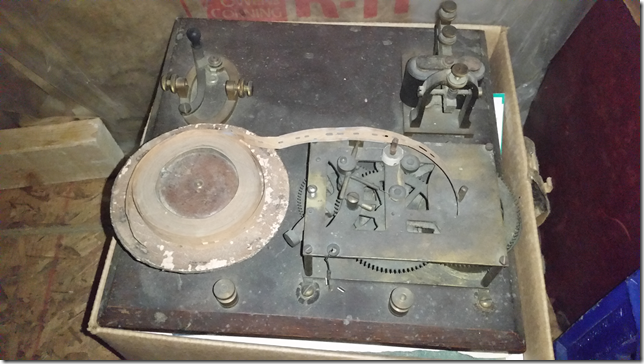 I believe this is narrower tape, know as "Wheatstone," and if so, I know the mfr of that machine. I have asked her this question and will get back to you with her response. Most all of my paper tape daze where with the 8-level one inch stuff, not the 5-level 11/16 inch stuff although I did use on early vacuum tube computer, a Bendix G-15, which did use this size tape. Anyway, she sent me some additional images. To add more to the mystery, I looked closer at the sounder in this machine and it appears to be the same as the legged sounder that posted about over a year ago. The sounder had no makers mark and those who replied to the post had not seen a sounder like either. It appears maybe my sounder may have come from a machine such as this. I have attached a photo of my sounder. The sounder on that code practice machine does not have the leg connections yours has, the wires just come through the base. Also, and this surprised me, the code practice machine was sold by the Dodge Institute. I had not been previously aware that Dodge sold practice sets. It is advertised on pages 304, 305 and 306 of the 1911 edition of Dodge's "Telegraph Instructor" book. I've attached .pdf's of these three pages. It apparently had the name, "National Automatic Telegraph Transmitter" and you could buy one from Dodge for $20 although it is not clear whether Dodge manufactured them or just bought them from someone else. The women who questioned me about this instrument had it restored and just got it back. I've included a photograph she just sent me. She also mentioned that the restorer told her that the instruments were marked MESCO (Manhattan Electric Supply Co.) but I haven't found any such code practice device in a MESCO catalog that I've seen so likely the manufacturer just bought MESCO instruments for the unit. Actually the owner of the code practice device figured this out. In an attempt to further educate her on how such machines would be used I talked about telegraph schools and home study courses for such training and of course mentioned the Dodge school and his book as it's probably the best known. She went rummaging through her grandfathers stuff and found the 1911 edition (which is about the time she said he learned) and then went through it finding those pages. I have an almost pristine copy of the 1911 edition but had not looked at it in a long while. So the credit for the research goes to her. Can anyone tell me if Athern Repeaters were used only on multiplexed lines or were they also used on simplex lines? 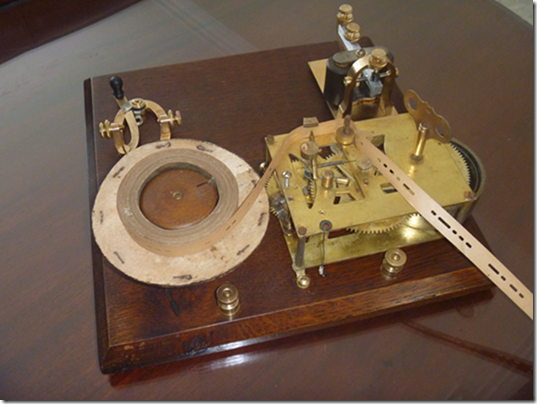 I am trying to build a demonstration set of telegraph instruments. They will be used to demonstrate telegraphy to the public and especially students. We have a science day coming up locally and i would like to include a simple bidirectional repeater if that is practical. The challenge is that not being a telegrapher retiree myself I do not know which types of equipment were used for which use. If anyone can offer any guidance on the repeater issue I would appreciate the help. 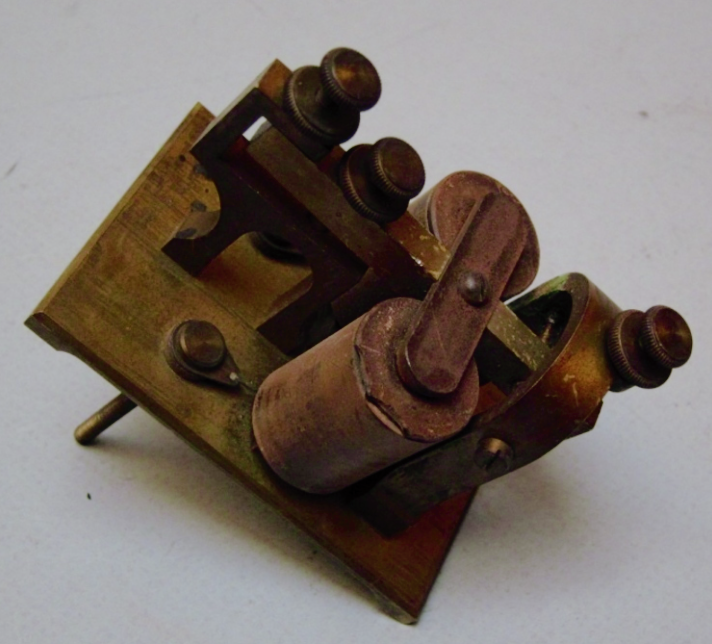 The Athearn repeaters were strictly “single line” repeaters intended to tie one neutral Morse circuit to another. I am fortunate to have one in operation here at FB office. They coul be used to connect a receive or send leg of a dux or quad to a single Morse circuit for “one way” service in either direction. To my knowledge, the Athearn repeater is just a single line repeater. It would not work on duplex lines and was normally used on simplex lines. It is possible that it might work on time division multiplex lines if the rate of multiplexing was not too fast but I have never read or heard of such a thing. There's lots of information about the Athearn repeater on the net. The MTC used to run an Athearn repeater between wire 11 on MorseKOB and the US dial-up hub. What is the date for Morse Day 2017? I thought it was Thursday, April 27. Well, the 27th is Morse's birthday, but for the convenience or our members, the MTC celebrates it on the last Saturday of April which is always the Saturday nearest to Morse's birthday. And of course we use the original Morse Code not that new fangled European code once called "Continental" but now known as International Morse. Single letter CW beacons have been rumored to be Russian in origin. There's also a cluster of them around 7033-7035 khz which are heard worldwide. They are all over the HF spectrum.